Review: A corrupt politician boss appoints a black sheriff in a western town and stands in the way of a railroad. 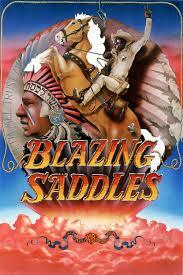 One of the greatest spoof westerns ever made. This is a much better film than I had anticipated as I had been looking forward to watching it for so long. Great performances from the two lead actors. This is a film that will have you laughing all the way through. The one scene that everyone knows and remembers (the fart scene) didn’t go on as long as I thought it would. The script for this was fantastic. Apparently John Wayne was asked whether he would like to be in the film but his response was “No but I will be the first to see it”. Just like so many Classic films like The Shawshank Redemption and The Great Escape none of them won any Academy Awards (Oscar Awards). This film was listed as one of Barry Norman’s 100 Greatest Films published in the Radio Times at the start of 2012. One film critic wrote about this film “This all-singing, all-belching western spoof remains one of Mel Brooks’s finest creations”.